A beautiful morning, Monday was. I crawled out of my tent early to get to the small bath house before anyone else, and to get an early start on the road. The sun was just coming over the horizon as I cooked breakfast and sipped coffee. Today I will reach the first National Park of the trip, 150 miles away. Not as long as it seems. About 30 miles will be on VA 8, a beautiful, sweeping road through Virginia farmland. Then all hell breaks loose. The final 120 miles will be on the super slab, I-81. On a Monday morning. Commuters, trucks, and a motorcycle vying for space to get somewhere quickly. Nice. Thirty miles of Zen-like riding come to an end as I lean the ST onto the acceleration ramp to I-81 North. I roll on the throttle as the big Honda’s V-4 responds with a growl and we merge into Monday morning traffic at 75 MPH. Trucks everywhere! My goal for the next 120 miles is to stay out of the slipstream of trucks and maintain my bubble. It’s a constant dance of acceleration, deceleration and lane changing. I click on my Mp3 and settle in for the ride. Destination Staunton, Virginia and Shenandoah National Park. One hour and forty-five minutes later I see my exit signpost ahead: US250 STAUNTON. Rolling off the throttle and downshifting on the exit ramp, I see my motel across the street. Good to be off that highway from hell. It’s a little past noon as I pull into the parking lot. Check in, unload the beaST, eat lunch at the restaurant right next door. I’m excited. Sixteen miles to National Park number one. Fire up the ST and roll onto US250. Oh Shenandoah, I long to see you………. ” Keep your eyes open out there sir. We’ve had numerous wildlife sightings right on the road this summer, including bear. You be careful” the park Ranger said as I handed him my fifteen dollar entrance fee. “Yessir” I replied. Thank you for the heads up.” A two finger salute and I was rolling onto Skyline Drive, the 105 mile backbone of Shenandoah National Park. That was no lighthearted warning the park Ranger gave. The speed limit along the entire 105 mile length of Skyline Drive is 35 MPH, precisely because of wildlife frequently using the road with other road users. Ten years ago when Roo and I made this same trip two-up, we came upon a black bear partially in the road having lunch! Scared the crap out of us both! 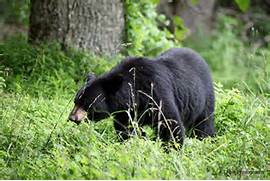 I swerved, not knowing what the bear would do, as it lifted it’s huge head to look at us, with leaves, twigs and grass hanging out of it’s mouth, chewing. Funny now. Not so much then. 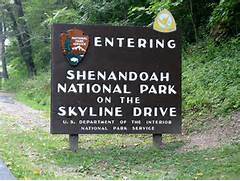 Skyline Drive is the only public road in Shenandoah National Park. It begins in Front Royal, Virginia at Mile Marker 0 (MM0), and weaves it’s way south through the Park to Rockfish Gap at MM105. 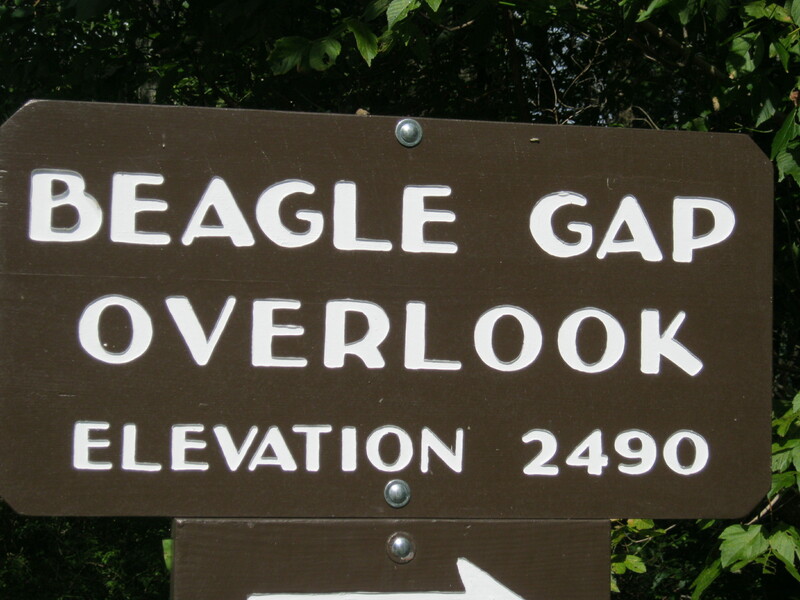 Rockfish Gap is also MM0 for the beginning of the Blue Ridge Parkway. I was traveling north, however I didn’t traverse the entire length of Skyline Drive. I rode about 40 miles in before having to turn around, as the sun was getting very low in the sky, and one doesn’t want to be on this road at dusk. It’s feeding time, and the natives get restless! Time to make my way back to my motel in Staunton. The light is getting dim, and beady, little eyes are beginning to twinkle along the side of the road. Tomorrow, I come back this way to Rockfish Gap, as me and the big Honda turn south for the first time to begin a blissful 469 mile journey on America’s Favorite Drive. Memorial Day weekend is here and it’s time to “get the hell out of Dodge” as the saying goes. 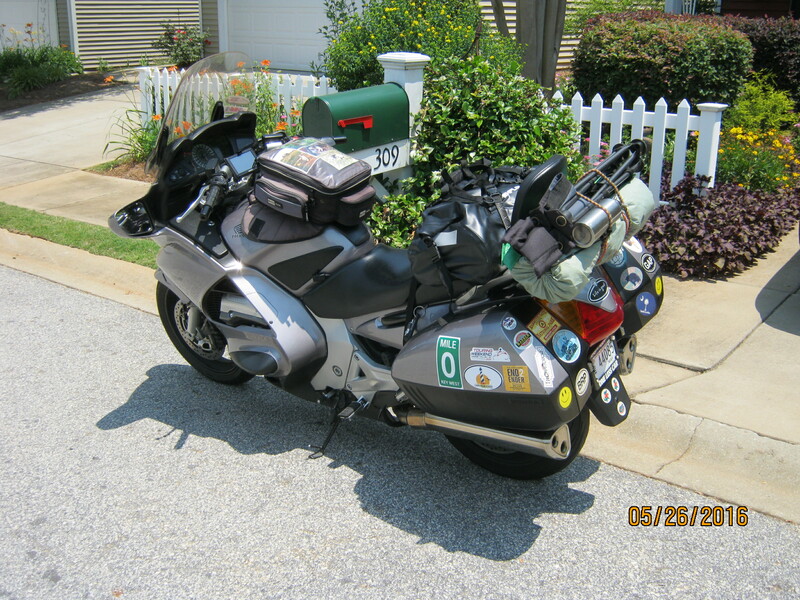 I know of no better way than to load up the big Honda with camping gear and head to the mountains of North Carolina. This is a solo trip, as Roo had a big week at work and opted to keep the home fires burning for my return and catch up on snooze time with the beagles. An early afternoon departure on Friday had me making a beeline northward to stay ahead of the supposed rain showers moving into the mountain area later in the day. Setting up camp in the rain is major suckage, so the most expeditious route was chosen. 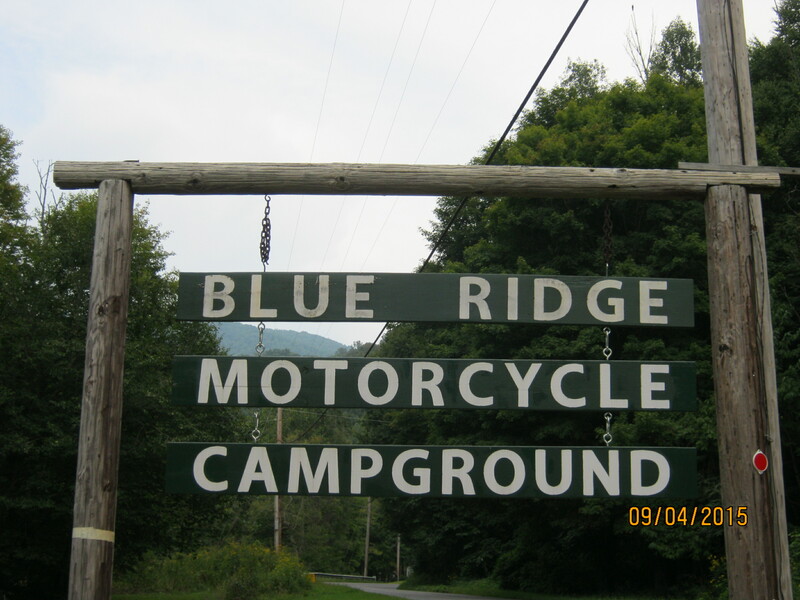 My destination and home away from home for the next two nights is Blue Ridge Motorcycle Campground in Cruso, North Carolina. 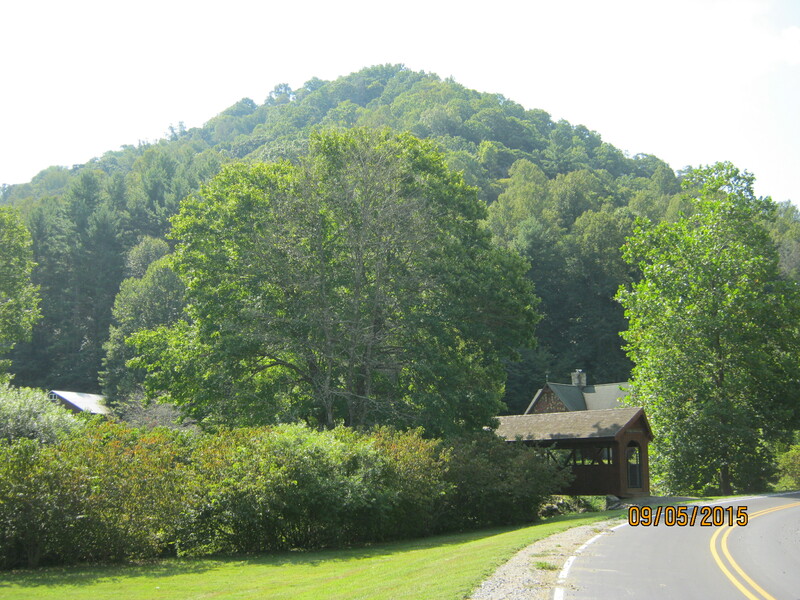 Crossing into North Carolina and through the town of Brevard, I enter the Pisgah National Forest. Highway 276 is a beautiful two lane serpentine road that bisects the National Forest and will take me up and over Cold Mountain, then drop me down twisting and turning right to the doorstep of the campground. 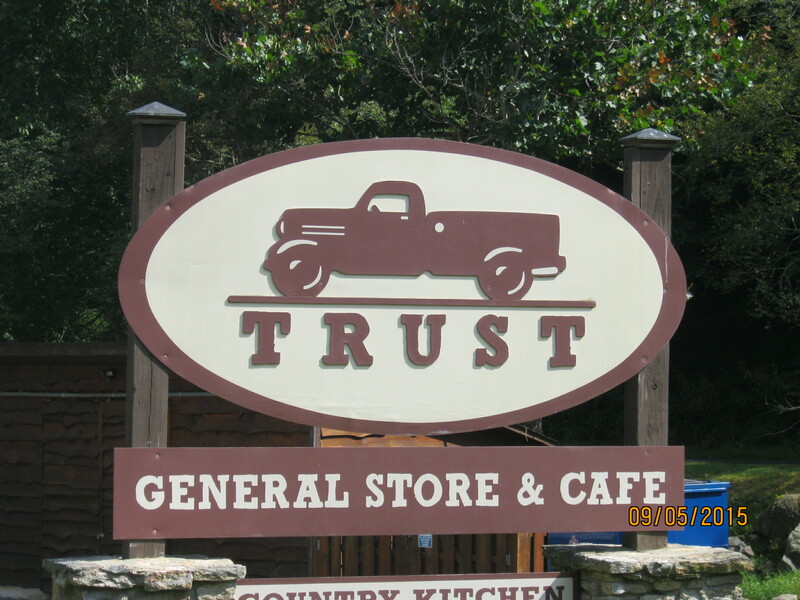 But first, a stop at the Pisgah Forest Visitor Center for a stretch, a drink, and the gathering of mental focus for the road ahead. Thankfully, being Friday, I had the road pretty much to myself. The hordes of people coming into the forest to camp and fish and just enjoy this beautiful place won’t begin arriving until tomorrow. Cresting the summit of Cold Mountain, riding under the Blue Ridge Parkway, the road banks sharply to the left and immediately drops down the other side. Highway 276 on this side of Cold Mountain is a 2nd gear road, with hairpin curve after hairpin curve along it’s four mile length. 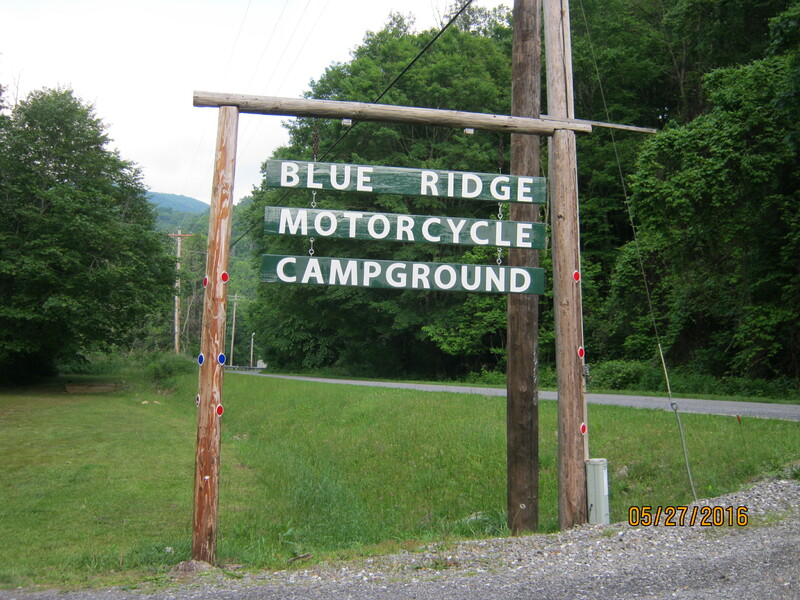 Blue Ridge Motorcycle Campground (BRMC) is one of, if not the oldest, moto only campground in the southeast U.S. It is a sentimental favorite of Roo and I, being the first place we ever camped by motorcycle, and, it is the closest one to our home. It is a beautiful place, and the surrounding area is a motorcyclists dreamland. Campground entrance: sacred ground for motorcyclists! 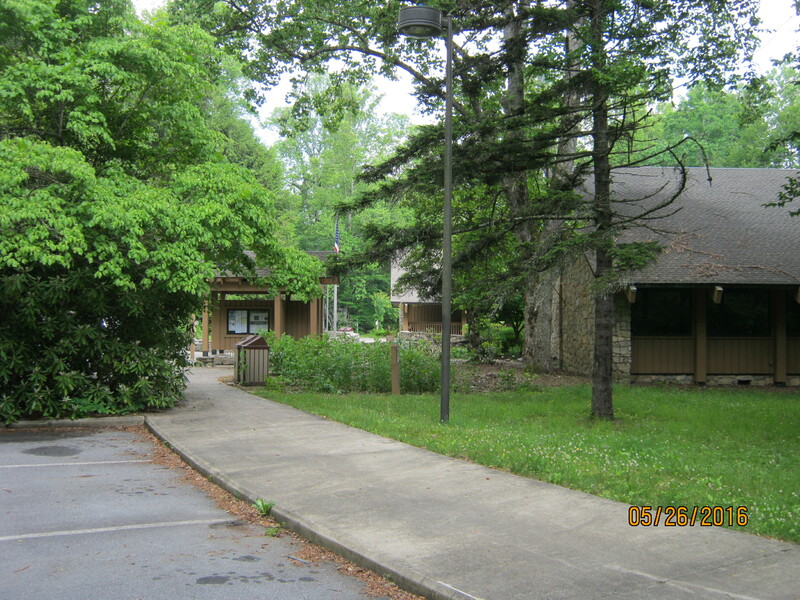 The Little Pigeon River flows under the bridge and winds through the campground. 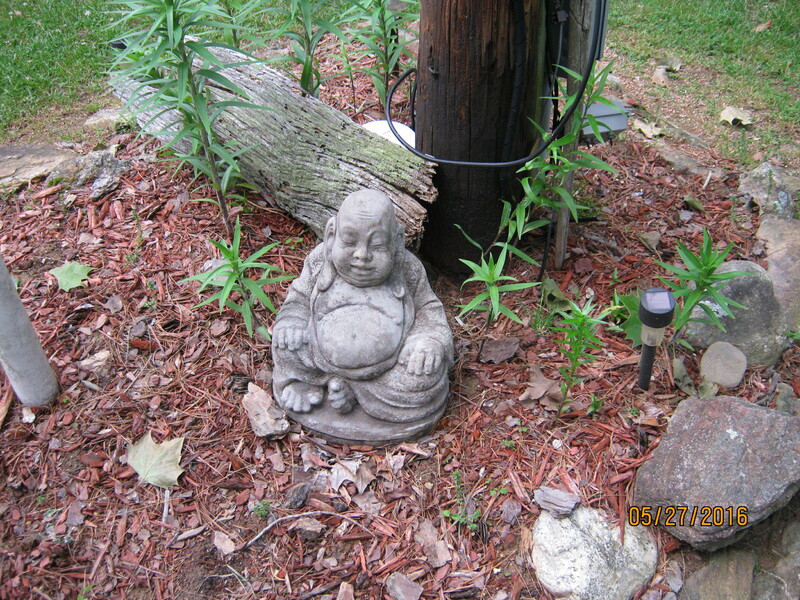 The Buddha wishes safe journeys to all who pass on two wheels. The downpour that preceded my arrival was all the rain to be had for the next 36 hours. After setting up camp, showering and getting out of my riding gear, I set about meeting other motorcyclists that were already here, and still others as they trickled in during the late afternoon. The big influx of bikers would happen tomorrow, Saturday, as the Memorial Day weekend officially begins. Saturday morning I awoke to a most gorgeous day. Temps were very cool, and last night I considered it to be downright cold, but as the sun crests the mountains surrounding the campgound, temperatures rise and we are all surrounded by astounding beauty. 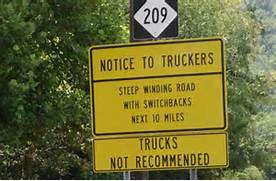 NC 209 is a serious mountain road. Big elevation gain, twisty, technical tarmac with numerous switchbacks, and not much room for error. It connects Maggie Valley, North Carolina (home to the famous Wheels Through Time Museum) with Hot Springs, North Carolina.You will be worked over by this road, and a respite in Hot Springs is very welcome indeed. Get your head on straight! This ain’t no joke! Arriving in Hot Springs, I shut the beaST down and stretch my legs. Hot Springs, as the name implies, was built around the bubbling springs that are in the area, and was a vacation destination for the well heeled of Asheville, North Carolina in the early twentieth century. Today, it is just a small mountain town boasting a few restaurants, lots of bikers, hikers, paddlers and sports car enthusiasts, and yes, hot springs. Having rested up from running The Rattler, I fired up the ST and headed down the other side of the hill. Here, NC 209 ends and US 70 begins. US 70 is a two lane highway with fast sweepers that have you doing 70 MPH down the mountain without even trying. 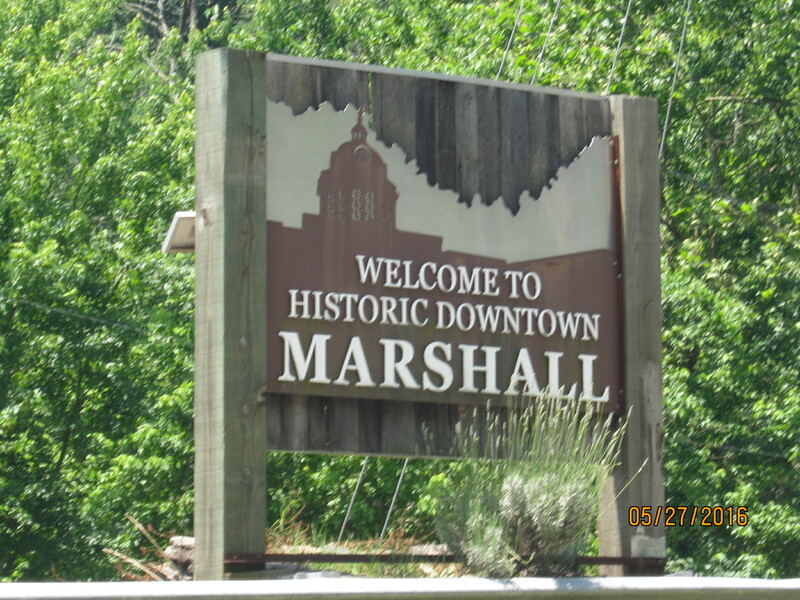 My next destination, for lunch, is the small hamlet of Marshall, North Carolina, just 10 miles down the road. Marshall is an old railroad town that was built right alongside the French Broad River, connecting the smaller mountain towns with the city of Asheville. Today, Marshall, like Hot Springs, is a haven for cyclists, paddlers, hikers, old hippies and young hipsters looking to escape the hustle bustle of Asheville, just 30 or so miles to the south. 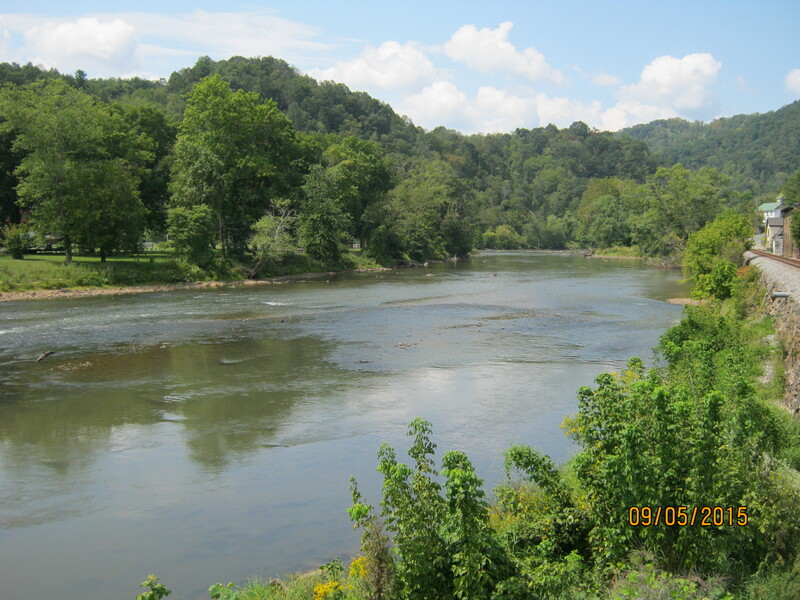 The French Broad is a beautiful river running south to Asheville, NC. The bridge traverses the French Broad to a beautiful park from downtown Marshall. By now, I was very hungry. 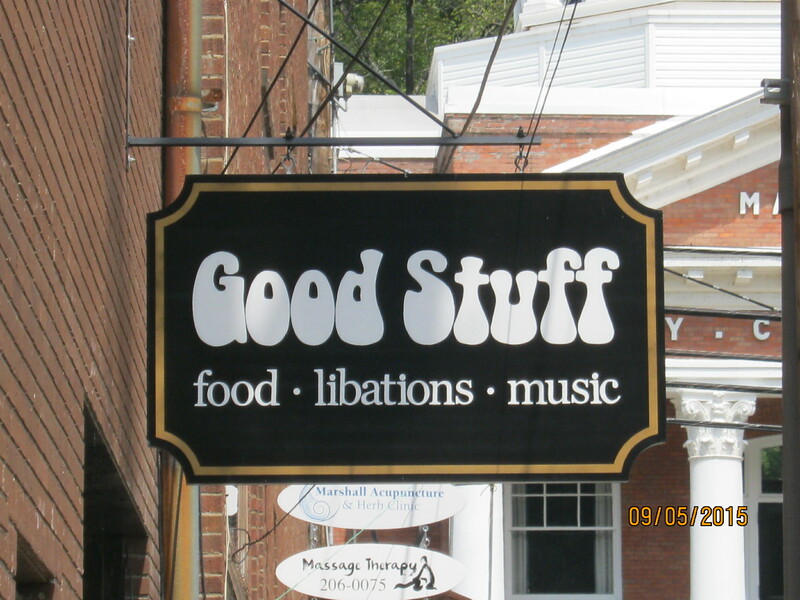 My plan was to eat at a favorite establishment called the Good Stuff Cafe. 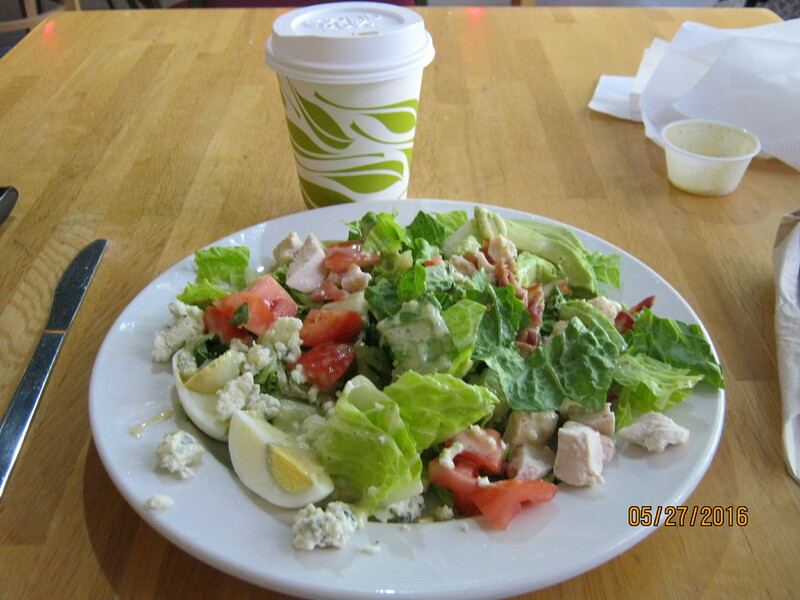 But as I walked downtown, I noticed a new restaurant right next door called Zuma Coffee, so I thought I’d give it a try. Any eating establishment with the word coffee in it’s name gets my attention. What a great place! Inside I met two other motorcyclists and a very talkative, but interesting, cyclist. The food was delicious and the coffee was excellent. This is my new go to eating establishment in Marshall! Cobb Salad a la Zuma. Protein, fat, leafy greens and caffeine to ward off any afternoon low sugar blues! No bueno when on a motorbike! After lunch, a short walk through downtown brought me to this 1940’s styled gas station turned diner, which every time I come here, is closed. 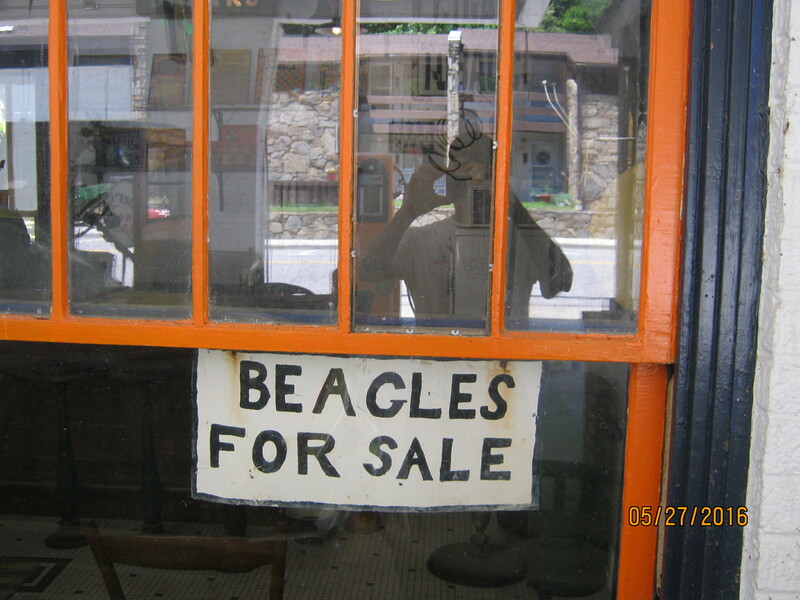 BEAGLES FOR SALE! I can fit one in each hardcase! Ha! If only……. After lunch it was back on the big Honda and rolling down US 70 once again. A couple of miles later I turn onto NC 251, aka River Road. The 251 parallels the French Broad River with gentle sweepers and astounding views all the way into the city of Asheville. On the outskirts of Asheville, I take the slab for a short distance to get to one of my favorite motorcycle roads, the Blue Ridge Parkway. 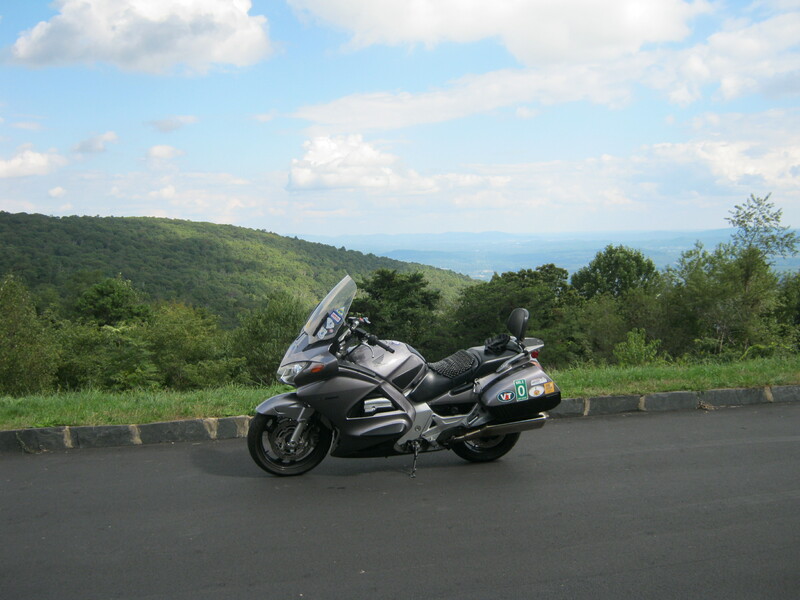 A stop at the Mount Pisgah Inn is a tradition of mine when on the Parkway to mingle with other motorcyclists and take in the astounding views. It is now late afternoon and time to head back to camp. I exit the Blue Ridge Parkway onto Highway 276, and enter the hairpin turns of Cold Mountain once again. This time though, the roads are dry, and the beaST and I are able to have some fun as we slice our way into the valley. Back at BRMC, I roll to my campsite and shut the ST down for the night. Tired, but a good tired, having come from a full day of negotiating technical mountain roads on a motorcycle. 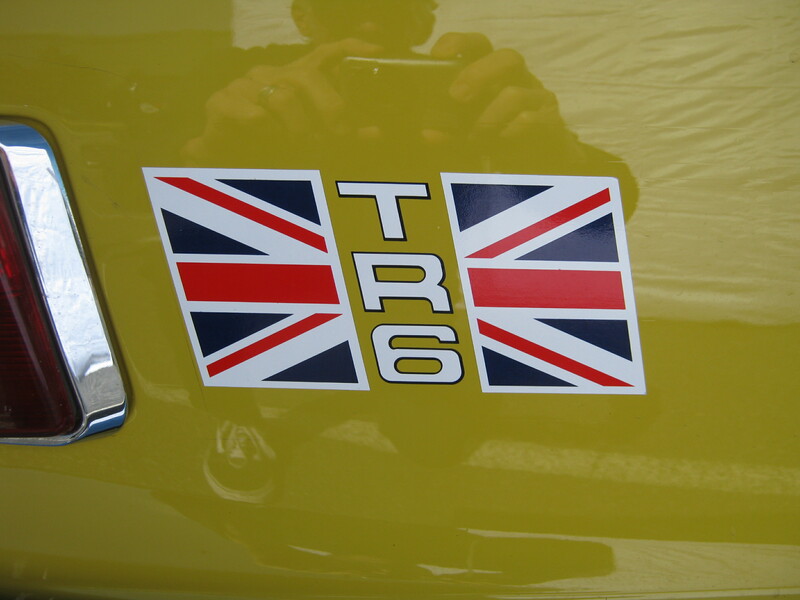 Time now for a shower, and a quick nap, then on to participate in a BRMC Memorial Day tradition. 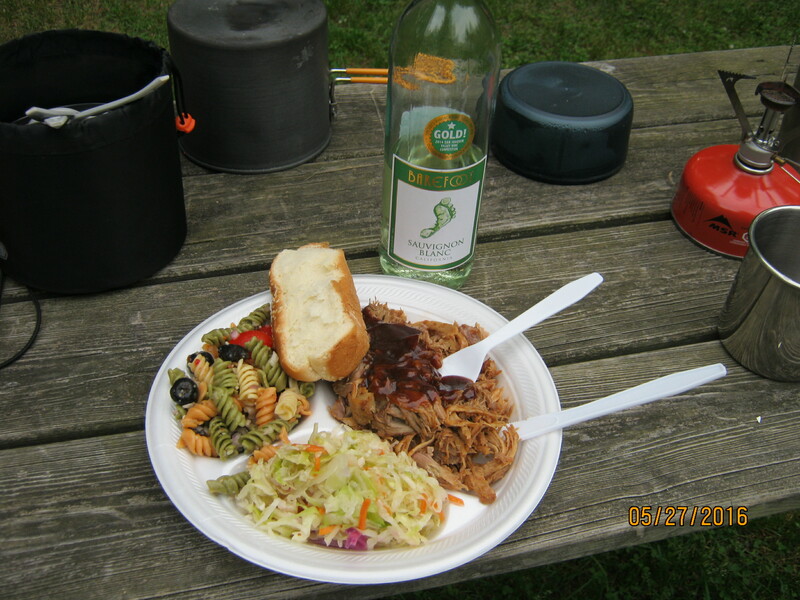 Pulled pork, slaw, and pasta salad. Wine with BBQ? I stray from southern tradition. 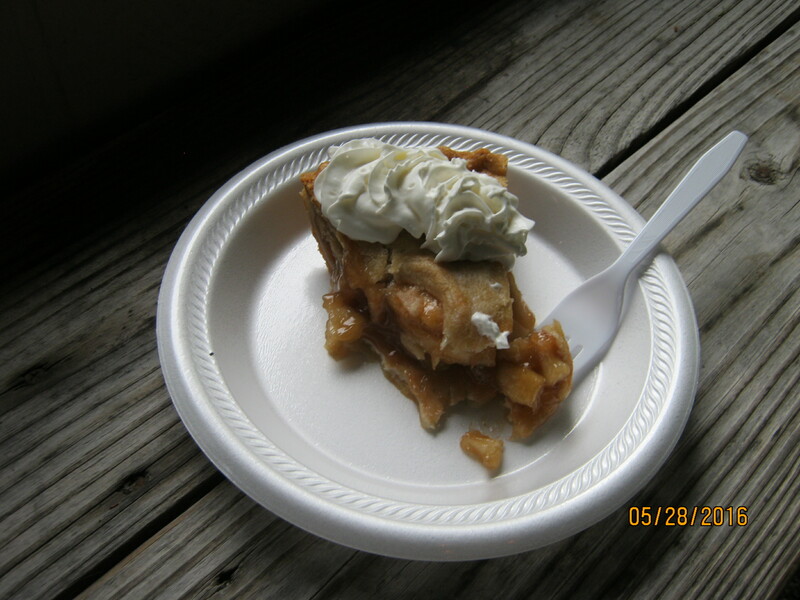 The finishing touch: apple pie! Delicious! Around the campfire once again that evening, everyone was recounting the tales of their respective moto adventures this day. I didn’t last long as I was bone tired. Off to my tent at 9:30 PM. Sunday we awoke to impending rain showers, and it actually did start raining as I was packing up my tent. Everything wet and loaded on the ST, I walked to the pavilion for my traditional one more coffee before I go. Chatting with other riders, waiting for the rain to let up, it was now time to go. Rain gear on, V4 fired up, roll out of the campground. I opted to super slab it home, as the roads were slick and I didn’t feel like climbing the Cold Mountain switchbacks in this weather. Good choice, it turns out. Home before I know it, it’s dry in South Carolina. Roo and the beagles run out to greet me, always a fantastic greeting. Do I have a surprise for them? 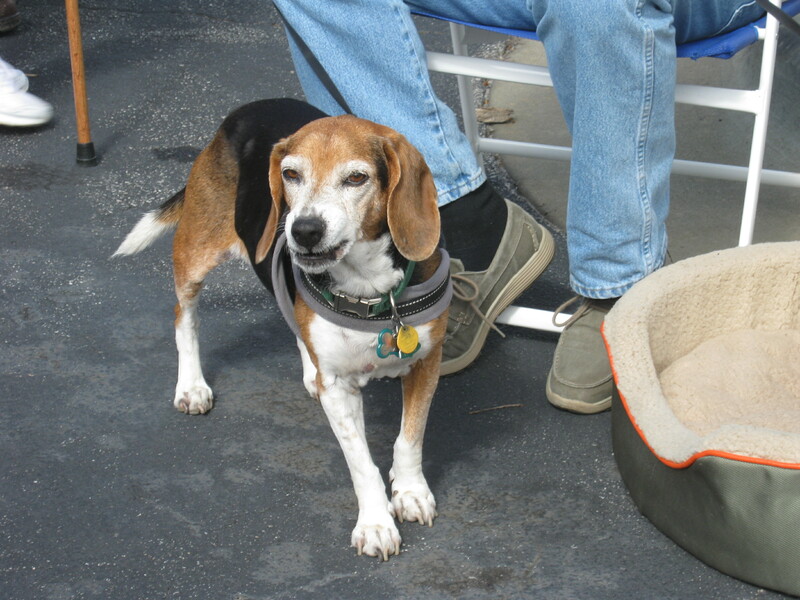 You know, those two beagles in the hard cases…….. They say one should always have a plan B when traveling. That is what they say. I agree. On Labor Day weekend, my Plan B was put into action before the ST’s wheels even began to rotate. 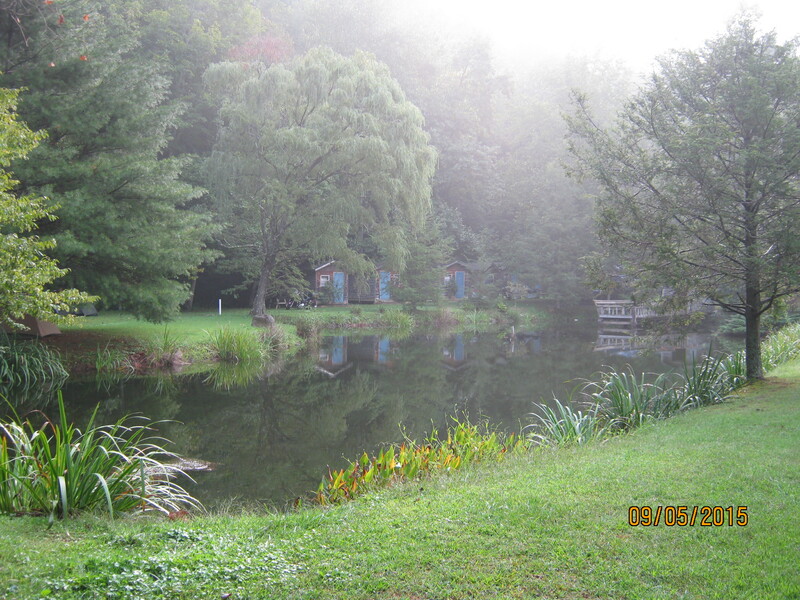 For weeks before, I was looking forward to taking a road trip to southwest Virginia and camping out for three blissful days at Willville Motorcycle Campground in Meadows of Dan, VA. Weather is always a concern for the traveling motorcyclist, and no less so as the week of planned departure arrived, and the weather pattern turned progressively worse. The day before departure (and the morning of), Weather Underground informed me that there were massive storm cells in the direction I was wanting to go. Didn’t look like a good time to me. I immediately scoured different travel scenarios and found that directly due north, the weather pattern was much more inviting, at least for the next two days. This was to be a head clearing trip, and I needed to go. Somewhere. The ST was already loaded and chomping at the bit. 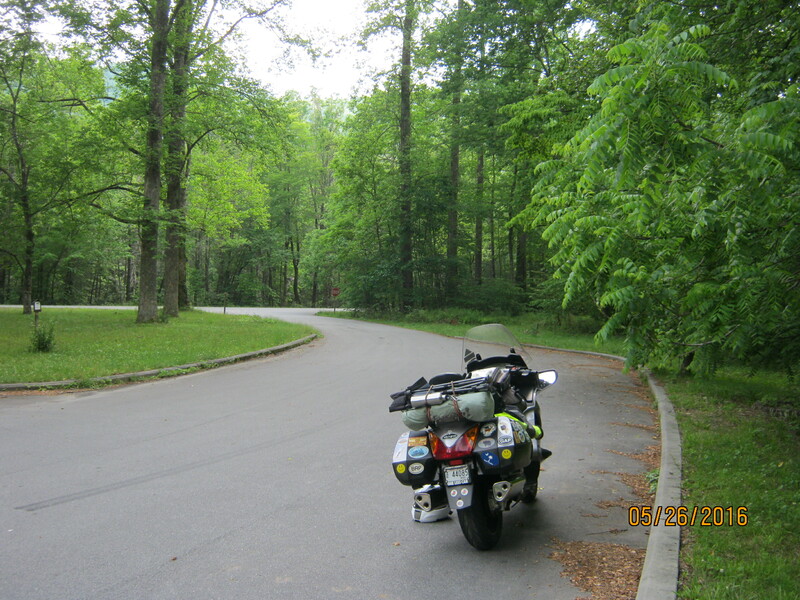 Due north became Plan B, so off we went to North Carolina and the Blue Ridge Motorcycle Campground. 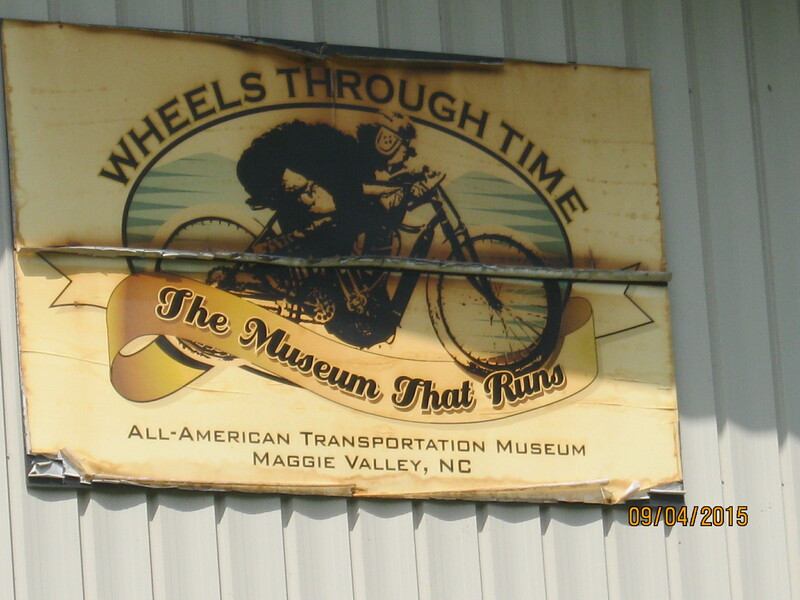 After setting up camp, I decided to ride into Maggie Valley, North Carolina and visit the famous Wheels Through Time Museum. But first, a much needed lunch stop was in order. 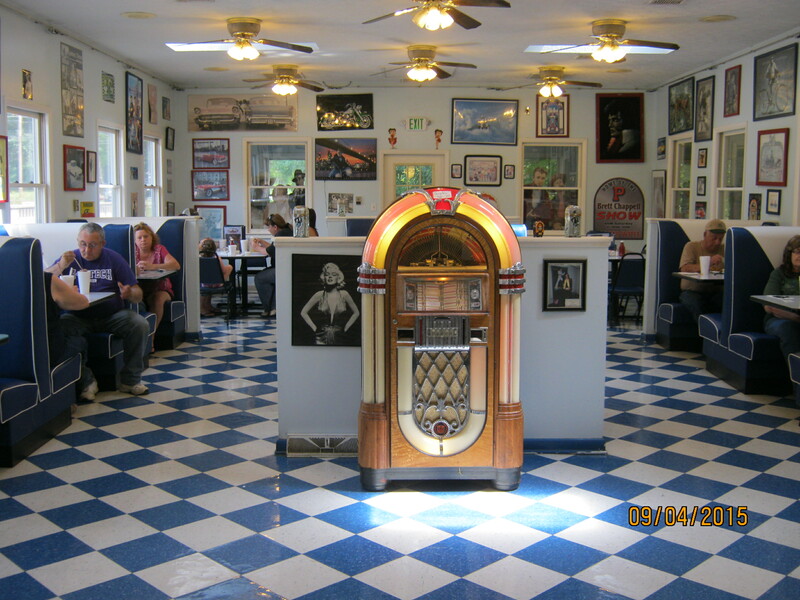 Jukebox Junction is my favorite greasy spoon lunch spot when in the area. After the feed, I motored on to Wheels Through Time. Curator Dale Walksler has put together an astounding collection of vintage American motorbikes through the years. Harley Davidson, Excelsior Henderson, Pierce-Arrow, Indian, Ace, Sears (yes, Sears!) and more are all represented here. 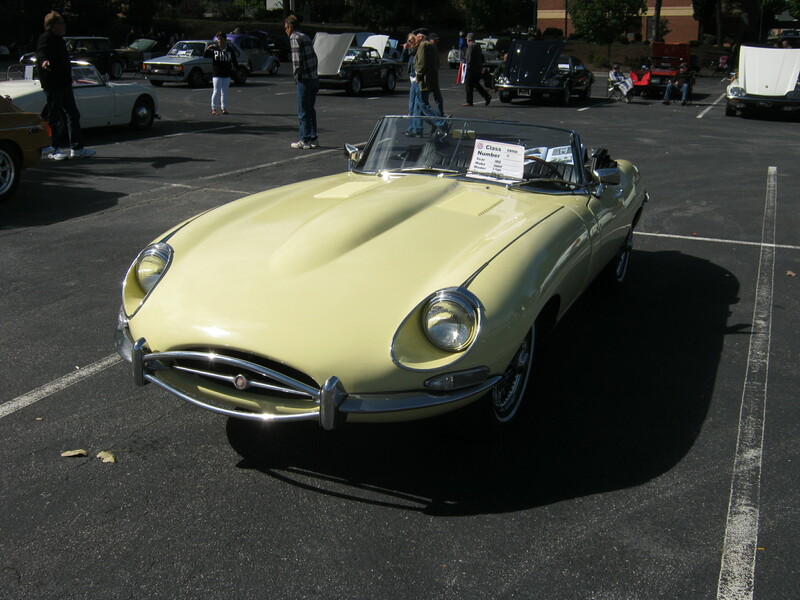 Vintage autos are also peppered throughout the museum, and even an airplane powered by a Harley Davidson engine! Walksler has/had (?) a TV show about his discovery of these gems and the restoration process involved. 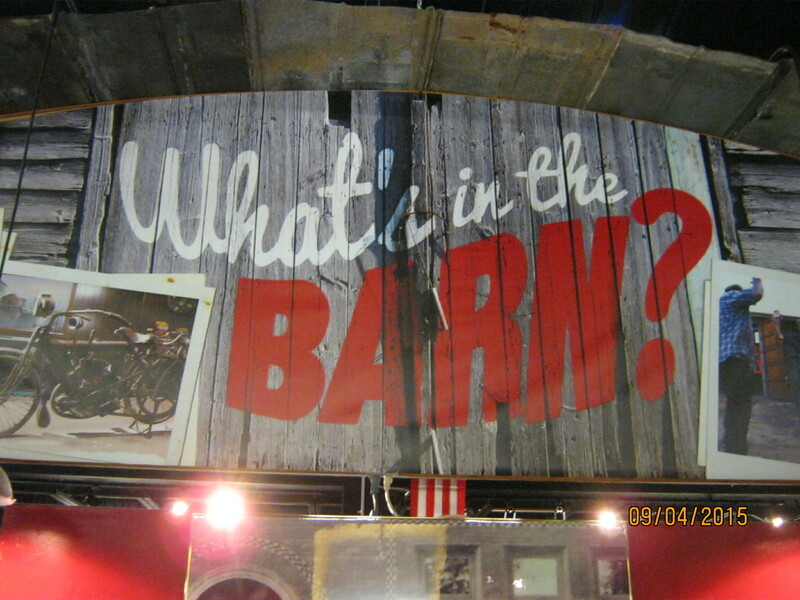 “What’s in the barn?” is the name of the show, and he has it running on screen in the museum during operating hours. So, just what is in the barn? Let’s take a look at a small sampling………. 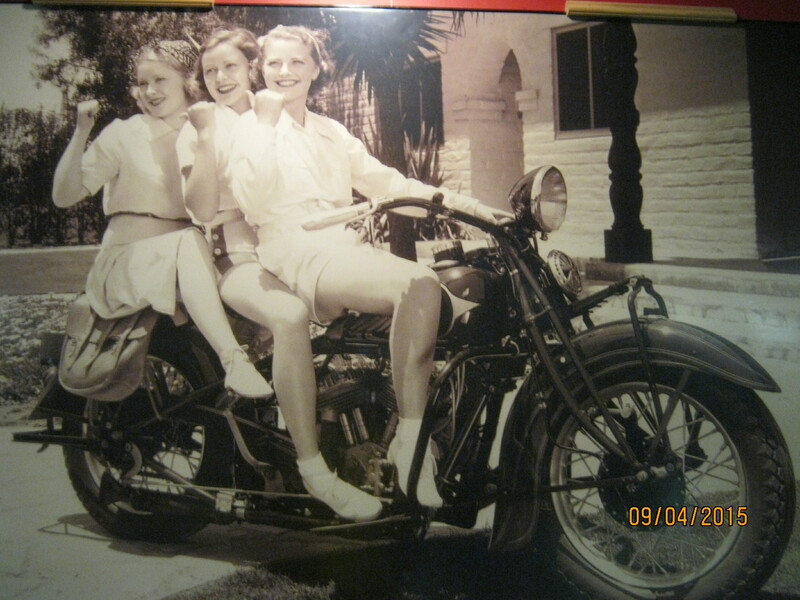 These girls look like they’re having a blast! The history of American motorcycling comes to life here. Literally. 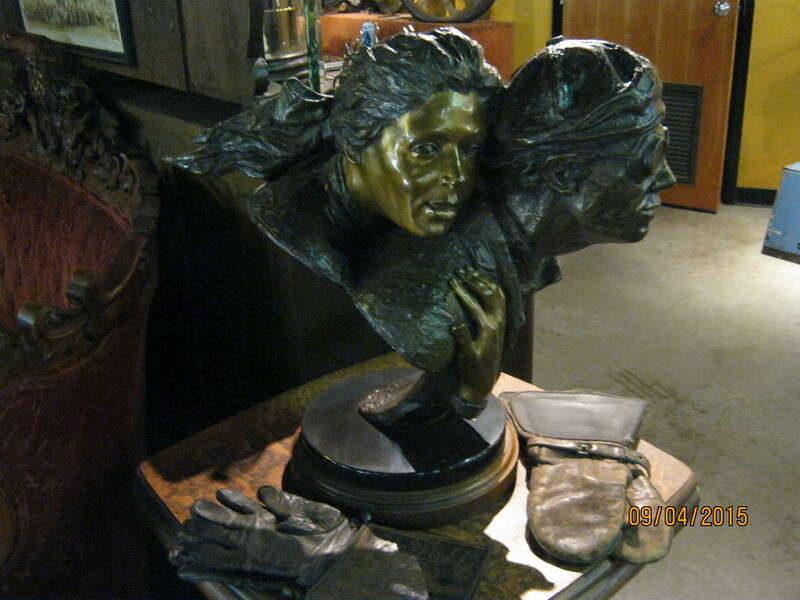 Throughout the day, Walksler fires up the ancient engines in his collection and rides these works of art and history around the property and in the museum building itself. The sound and smell of these internal combustion engines, some over 100 years old, is astounding and an assault on the senses. Fantastic! If you have never visited here, you must. And, of course, the motorcycling roads in the surrounding mountains are nothing short of exhilerating! On the way back to camp, my weather luck ran out. As I came out of the museum, looking to the east, I saw scary looking clouds and rolls of thunder vibrated my eardrums. No, it wasn’t a group of Harleys. Naturally, east was the direction I was heading. It wasn’t raining yet, but I knew I was going to get wet at some point, so I slipped into my rain gear and rolled out of the parking lot. Fifteen miles to go back to BRMC. I might beat this out. 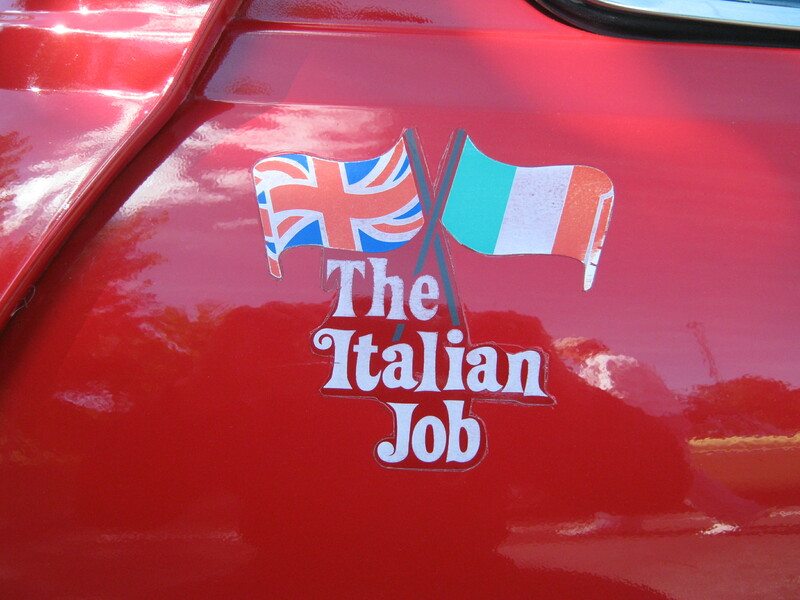 Don’t all motorcyclists say that? With 4 miles to go, there it was: a wall of water right in my path. It was dark, thunder pierced my earplugs, and now lightening seemed too close for comfort. But there was nowhere to pull over, and if there was, I couldn’t see through the sheets of water anyway. Thank god there was a truck in front of me with working tail lights that acted like beacons in the deluge. Four miles to go………. Within half a mile, I popped out of that storm cell onto dry roads like nothing had happened. Looking in my mirrors, I could see that wall of water dropping further back behind me. Whew! Mountain weather. Gotta love it! The next morning I awoke to a eerily beautiful, fog in the valley. It will be about 10 AM before the sun rises over the mountains and burns off this fog. NC209 is a super scenic, technical, challenging motorcycle road that will have you grinning from ear to ear, or, if unprepared, scared out of your wits as you try to negotiate it’s curves. 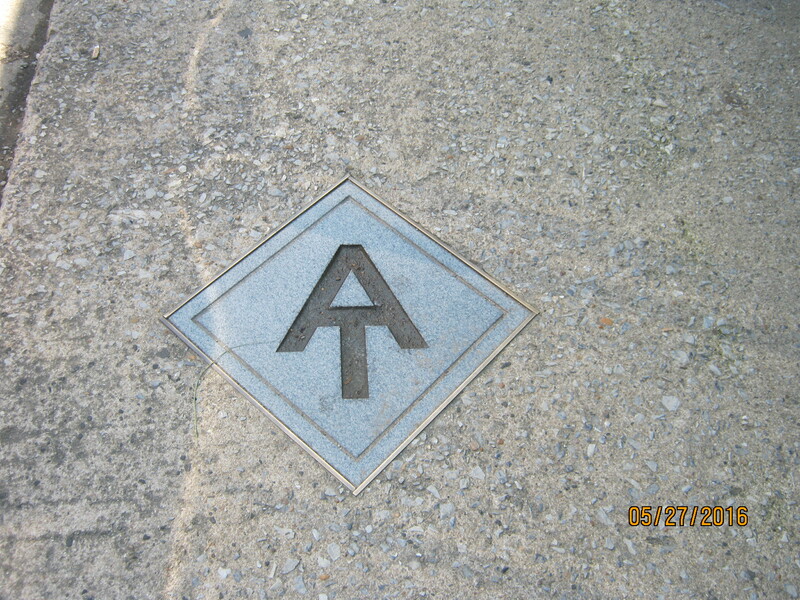 The 209 terminates in Hot Springs, North Carolina, a hotbed for hikers hiking the Appalachian Trail. 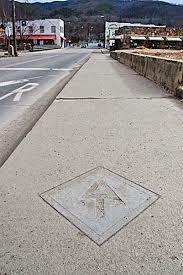 The AT passes right though “downtown” Hot Springs, the sidewalk actually being part of the trail. 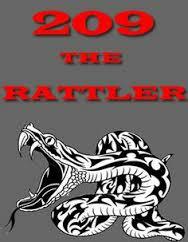 On the way up the 209, you pass through the tiny communities of Trust & Luck. On this road, you need both. Trust in your machine and your own mountain riding skills, and a bit of Luck as you lean way over in the curves looking to erase those chicken strips. The twisty bits of The Rattler begin right past the Trust General Store. 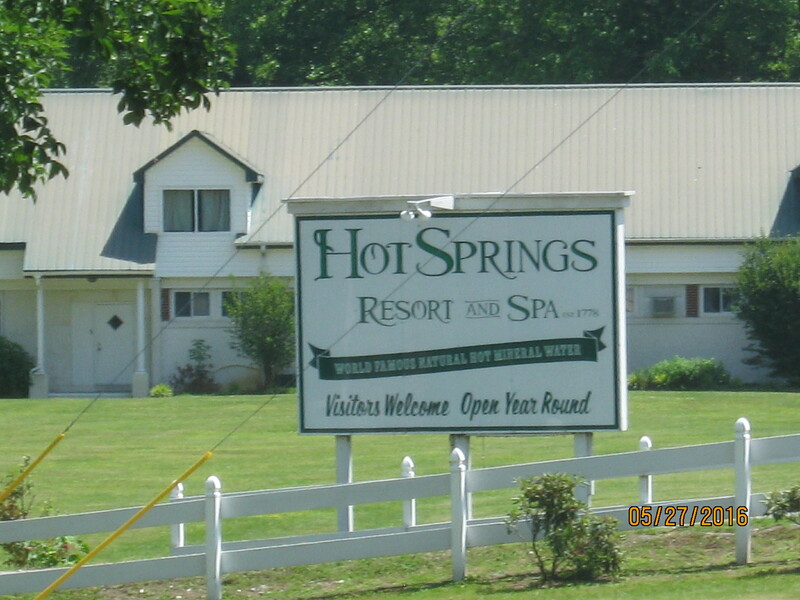 With any Luck, you’ll make it to Hot Springs unscathed. Beautiful mountain scenery like this is yours for the viewing on the 209, but don’t look at it on the fly! Rolling through Hot Springs after an exhilarating ride up The Rattler, I began my descent into the tiny town of Marshall, North Carolina. One of my favorite eateries is here, Good Stuff Cafe, that used to be housed in a de-sanctified church. They have since relocated to another building. Could the taking on of craft beer and wine sales upset the heavenly powers that be and forced the move? God only knows. Lunch was awesome. I picked up a bottle of Spanish white wine for the campfire this evening, then strolled out the back door to the patio for this view…..
Today’s journey is almost over. I mount the beaST and head south, following the French Broad to the city of Asheville. There I catch the Blue Ridge Parkway and meander back to BRMC. 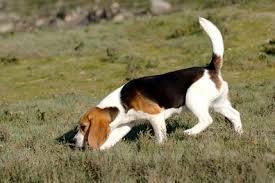 Tomorrow I’m homeward bound to Roo and the beagles. But there is still an evening of fun and mingling with other moto campers around the campfire, and a bottle of really good stuff with a Spanish label. 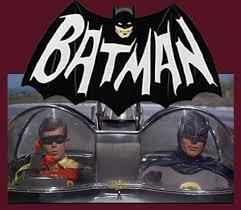 A Test Ride: To The Bat Cave, Robin! Nope. Didn’t get a new bike. But it felt like one. 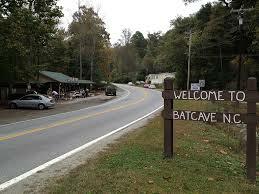 And, yes, there really is a bat cave in the mountains of North Carolina. So, I designed my 225 mile route to test the ST’s new front end, and reassure myself that my riding skills were really not deteriorating. 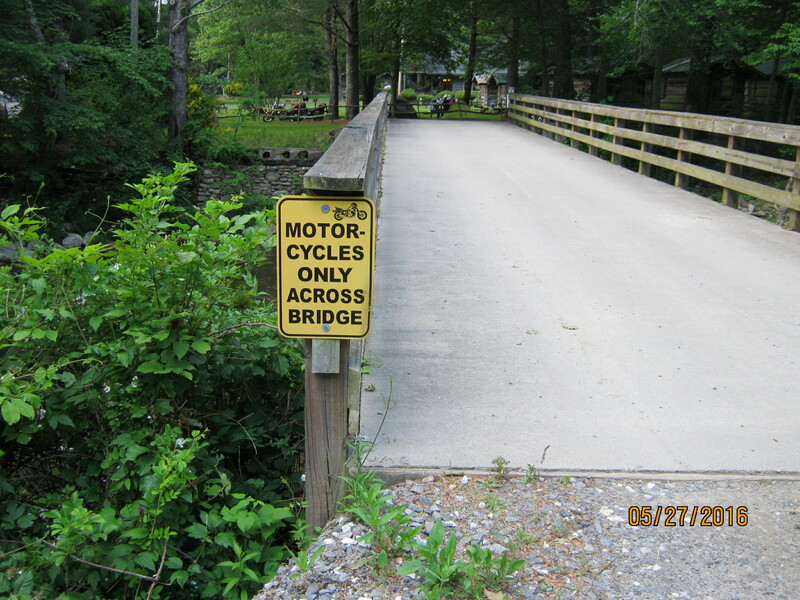 The real test would come in Bat Cave, North Carolina on Bat Cave Road two thirds into my ride. I knew what the problem was. The beaST was behaving like the huge motorbike she is. Turning into curves too quick, not holding a line, and me having to fight and make micro adjustments mid-turn on these mountain roads. All contrary to the smooth riding, glued to the road responses that she had when we first met. It was getting old, and I was losing the love. She ignored all my inputs and commands from the handlebars and my body, just like a beagle on a scent. Adorable, but when on a scent, you don’t exist. Just how I felt on the beaST. I didn’t exist! So, what did I do? First, I waited two riding seasons before doing anything. I had just changed the front tire, and soon thereafter is when handling started going downhill (not the tires fault). Not wanting to spend the money to fix things without shodding a new tire, I sucked it up and rode as conditions got steadily worse. Finally, this month, I checked the front tire. Ah, tread down to the wear bars. Good. I checked the mileage on the tire; 12,000 miles. Perfect. It’s time! Change fork oil (springs were changed last tire change). THE BIGGIE! Changed the original steering head ball bearings with tapered roller bearings. This was the crux of the problem. The next day I left home at 8 AM and headed to the mountains. 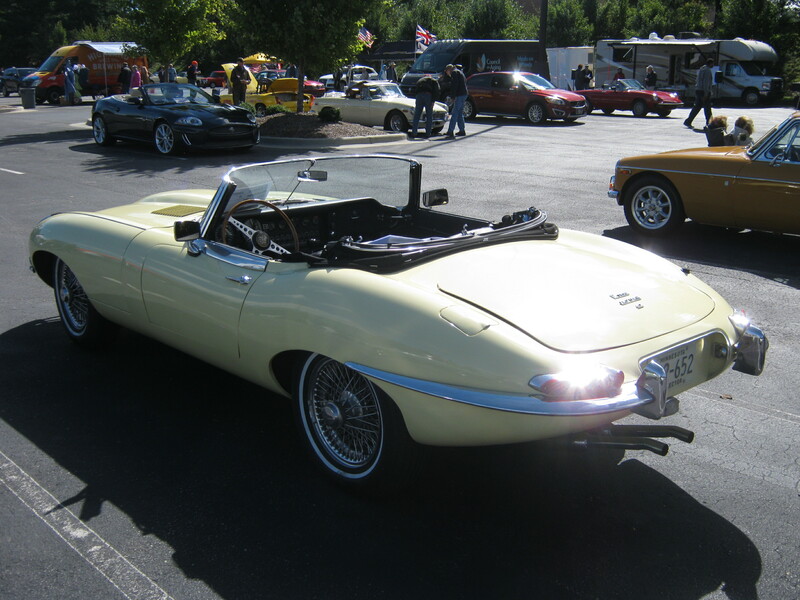 The pre-test would be on the Blue Ridge Parkway with her sweeping uphill and downhill curves. The ST performed flawlessly. I did notice a difference, but I was still unconvinced. 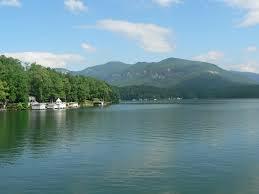 A lunch stop at Larkins On the Lake restaurant in Lake Lure, North Carolina fueled me for the real test to come. 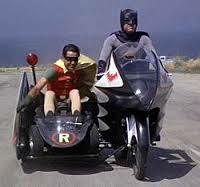 Bat Cave Road runs from Old Fort, North Carolina to the small hamlet of Bat Cave, North Carolina where Batman and Robin live in retirement. The road to Old Fort is a joy to ride: gorgeous scenery and wonderful sweeping curves. Once in Old Fort, I turn onto Bat Cave Road. Let the test begin! Bat Cave Road starts out docile enough for the first mile or two. Then a sharp 180 degree right turn switchback has you twisting and turning as the elevation increases. Climb, climb, climb, the beaST leaning right and left. Crest the ridge line, then descend, twisting, turning, leaning into the town of Bat Cave. No wonder Batman & Robin chose this place to hide out from their adoring fans! So, how did the ST perform? Was I pleased? You bet! It was like riding a new bike. The improved handling was magical. With the slightest input from me, the ST responded in the curves like she was riding on a rail. My grip on the bars was the lightest in years, almost like I didn’t have to hold on. 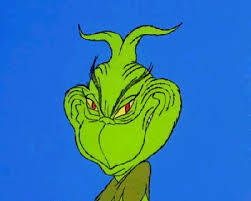 I wore a grin from the top of one ear to the other that would rival the Grinch’s grin on Christmas Eve. Holy Honda, Batman! She handles like a Dream! 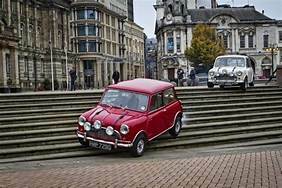 The problem was the steering head bearings. For some reason, all motorcycle manufacturers use ball bearings in the steering heads instead of tapered roller bearings. Over time, ball bearings “pit” the race they sit in, creating a choppy feel to the steering where the bearing gets “stuck” in the pitted area of the race. Not a real problem on the straights or sweepers, but get into real serious curvature and you will find yourself constantly making micro-adjustments to the steering in mid-curve. Frustrating, unsettling, and erodes your confidence in riding the bike. Change out your steering head bearings! No matter how young your bike is, next front tire change swap out the ball bearings for tapered roller bearings. If your bike has a few years on it, do what I did and go for the whole shebang. Fork springs too, as they are a price point item (cheap). 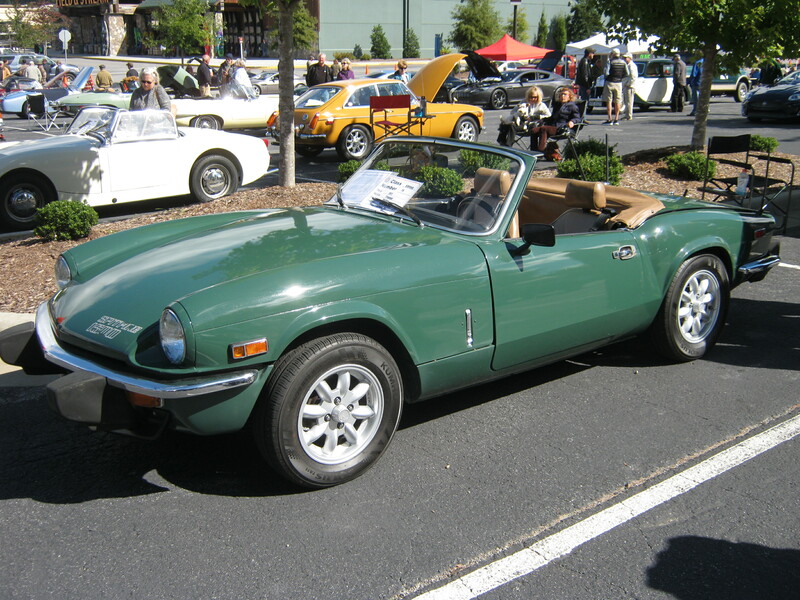 It’s a bit of money to spend if you are mechanically declined, like me, but well worth the investment. I got my baby back & I’m a happy boy!